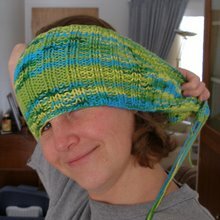 Finny Knits wrote a post explaining her inability to do anything without a clear mental vision and I think that this is exactly the sort of thing she was talking about. I identified with her when I read it, but clearly, I had no idea what I was actually capable of doing when left to my own devices. The picture above of the watermelon on my toilet (the only place dark enough at midday to show the true splendor of my work) shows exactly what happens when I proceed without a clear vision. Scary, isn't it? So, here's how this happened. Last night as I lay in bed, I thought and thought about Randa's birthday party's lack of theme. So, I decided that what the party really needed was a watermelon carved with the words Happy Birthday. OK, sounds cool. But not really really cool. Not, "hey I went to this awesome party and you wouldn't believe what her mom did!" type of cool. What I needed to do, I thought, was carve a face on the the watermelon. As I thought some more I realized that I wanted to carve a watermelon with Randa's face on it. What could be more fun that to see your own face smiling back at you from a big glowing watermelon? I once read an article about how to carve pumpkins to look like specific people and it was with that happy plan in my head that I drifted off to sleep. This watermelon, I must say, looks nothing like Randa. Here's the picture I was working off of. It just turned out to be a scary, demented version of her. How I wish it was Halloween right now. It would be so perfect. I am so going to do another one of these in October. I did briefly consider not adding a real picture of Randa. Then, those of you that have never met her, might not realize what a crap job I did on the carving. You might just think that I have a creepy daughter with huge eyebrows. I don't. But, that's just not the kind of person I am. Go ahead, scroll back up to the watermelon and laugh a little. I don't mind. So, I did also carve a watermelon that says 'Happy Birthday'. Luckily I had just reorganized everything in storage so I knew exactly where my pumpkin carving tools were. Yes, I do have a set of pumpkin carving tools. And I love them so don't laugh. I believe that my sister took a picture of the happy birthday watermelon when it was lit by candles. It's extremely difficult to both host a party and get pictures. I'll add that in after I ask her nicely to upload it to Flickr tomorrow. Too late to call tonight. 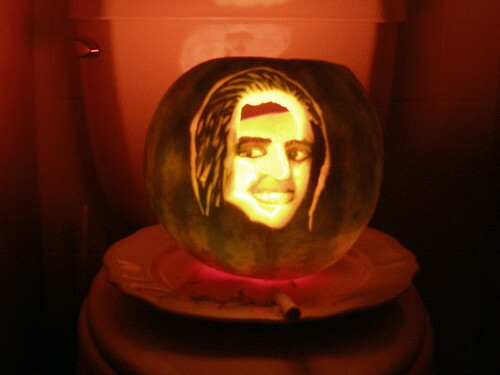 But for now I'll leave you with the following advice... save any scary watermelon (or pumpkin) carvings for Halloween. They're just insulting if you give them as birthday presents. It's like saying, "Hey, you're ugly." And no one wants to hear that on their birthday. actually, I know she looks scary on the watermelon but honestly, you have done such a fantastic job of shading etc...how on earth did you carve those teeth? She's a very pretty girl though and I wish her a happy birthday. You are such a lovely, fun Mum! 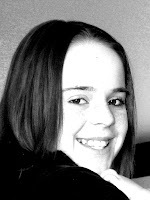 She looks like a cute, girl version of Jack Nicholson in The Shining! ok, i have to admit when i started reading the post i thought this was part of last year's halloween carving fiesta... and did think it was johnny's younger brother. however, i do think the carving medium would be considerably easier than watermelon. hahaha. so i hope this melon is still in the freezer waiting for next month to finally roll around!